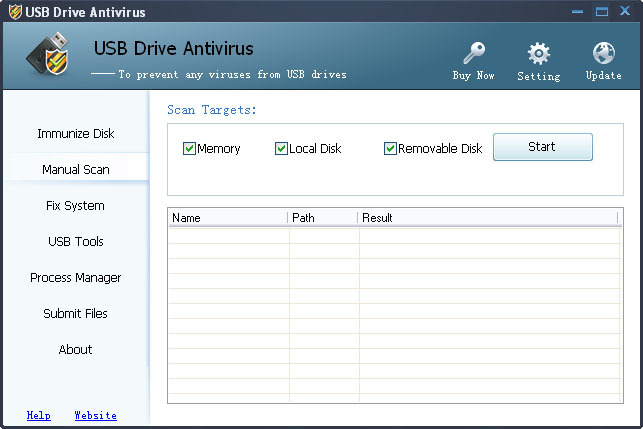 USB Drive Antivirus provides 100% antivirus protection against any viruses trying to attack via removable media.When an USB device is inserted into your computer, it will automatically scan it, block and delete usb virus and trojans. Compare with other antivirus solutions, you will find out its highlights: USB Drive Antivirus provides 100% protection against any threats via USB drive, however, the majority of other products are unable even to guarantee 80% protection.USB Drive Antivirus is the best usb antivirus software to permanently protect offline computer without the need for signature updates, but other antivirus software should update signature database regularly, and they cannot effectively protect offline computer. This light and easy to use solution is compatible with all software and doesn't slow down your computer at all. You pay USB Drive Antivirus once and get it all, however, other antivirus products should be paid for updates every year. Free malware scanner to clean and protect your PC from viruses, spyware, trojans, bots, adware and worms. It uses 2 major scan engines to find more than 4 million different types of malicious software. Including file guard and surf protection. Intelinet is global internet security leader. Used by more than 9 million people worldwide, Intelinet is the most comprehensive destination for those looking for complete protection of their PC as all-in-one security and repair solution. Presenting, eScan 11 Internet Security Suite designed for home and small office users that provides comprehensive protection to your computer against objectionable content and range of information security threats. a-squared (a2) is a complementary product to antivirus software, which is specialized in protection against harmful software. Antivirus software often features an inadequate protection against Trojans, Dialers, Worms and Spyware. a² fills this gap. PestBlock is the best solution to find and destroy hidden threats in your computer. He scan your memory, registry, hard and optical drives for known Parasites, Adware, Spyware and other unwanted software. Max Spyware Detector is a complete solution for individuals, professionals and home users to scan, detect and delete spyware to get rid of the malware,popup, keyloggers and trojans instantly. Get Powered with Smart scan Technology and Max Shields.